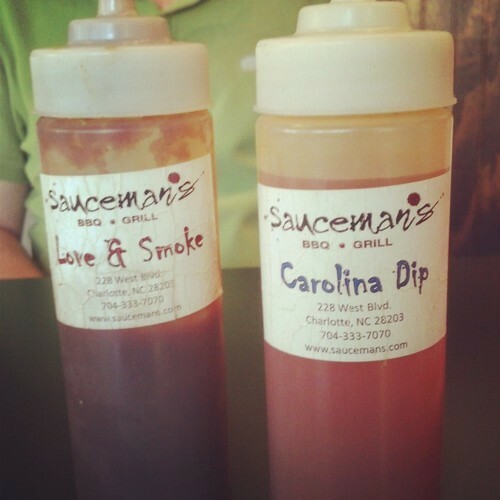 Monk: Sauceman’s has been around for a few years (2009, to be exact), but gained some fame when pitmaster Zach Goodyear won the NC episode of “BBQ Pitmasters” that was filmed in Charlotte last fall and aired earlier this year. His win was made even more impressive when you add in the fact that he defeated two established pitmasters and joints in Sam Jones of the famed Skylight Inn in Ayden (est. 1947) and Debbie Holt of Clyde Cooper’s in Raleigh (est. 1938). I had actually visited the restaurant pre-blog, but was interested to visit again for a review with Speedy in tow for the first time since December (wow, weird). Speedy: It was good to get back to a ‘cue joint with Monk, as that’s one of the pillars of our brohood. 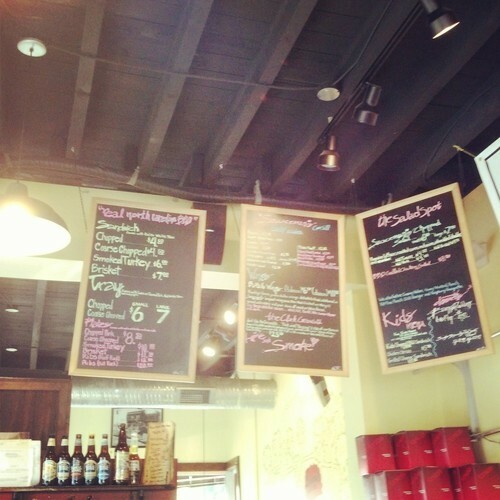 This was, in fact, my first trip to Sauceman’s. I wasn’t really expecting much, as I figured if it was really something to write home about (and I DO write home to Mama Speedy about great barbecue), I’d have tried it before. But still, exciting to check it out. I really liked the atmosphere. 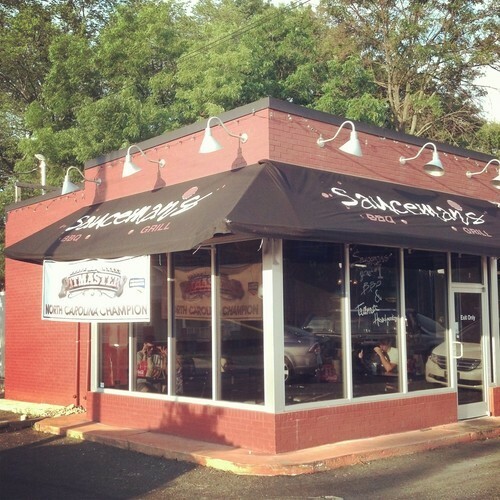 While the inside is a little difficult to navigate, with the register basically in the middle, Sauceman’s has a nice outdoor patio and is an enjoyable place to eat a meal. I was a little surprised by the menu, as it had more variety than I expected. Unfortunately, there was no combo plate, so Monk and I were basically limited to two meats. We ruled out the brisket and went with the all pig choices of chopped pork and ribs. We ordered and paid at the register, and the food was brought to our table, though our orders were not brought to us at the same time (or even close to it). 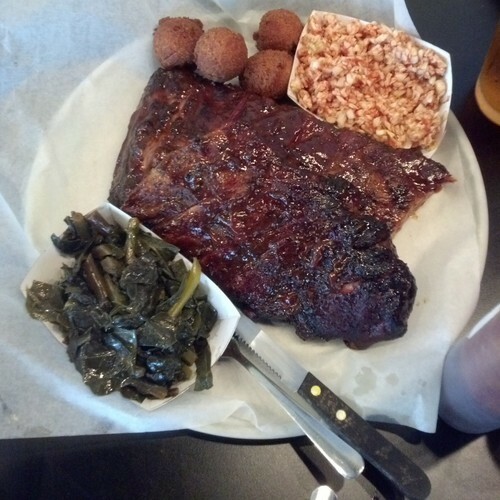 Monk: The pork at Sauceman’s is cooked Lexington style, which is a welcome sight for Charlotte where you seem to get every style except, despite its proximity to the actual town of Lexington. Unfortunately, the chopped pork on this night came out a little dry. And by “little” I mean “a lot.” Speedy and I posited that perhaps it had been sitting for a few hours underneath a heat lamp and dried out in the process. Once I added a combination of the Carolina Dip and Love & Smoke sauces from the table, the moisture returned and the pork became passable. But still, it was a little disappointing. I’d be curious to see how different it would be if I came earlier in the day, say for lunch. So Speedy, in terms of the ribs I thought these were quite good but how do you think they stack up with other ribs in Charlotte? Speedy: The ribs were very good. They were tender, but not to the point to where they fell off the bone – you could get a good bite. They were also perfectly sauced. They weren’t the best ribs I’ve ever had by any means, but they probably stack up against any I’ve had in Charlotte – on par with Queen City Q and Midwood Smokehouse. I enjoyed them quite a bit more than the pork. 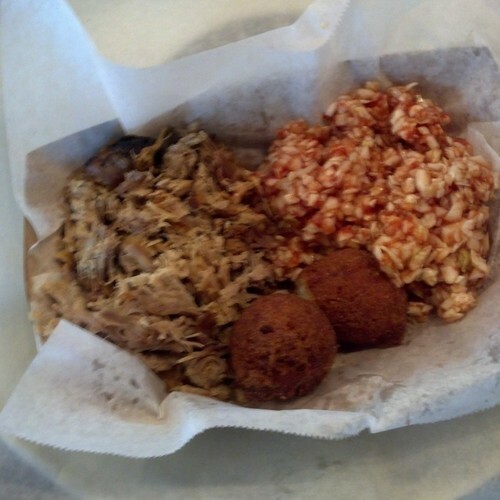 Monk: I liked the large spherical hush puppies more than Speedy. It had a thick crust of fried batter which put him off but I dug it as well as the sweetness of the puppy. The slaw was a red slaw but came coarsely chopped. And finally, the collards were quite good. All in all, I’d say the sides added to the meal as opposed to detracting from it. Unfortunately we did not get the sugar biscuits, which I had in my previous visit and were quite good. Speedy: Agreed that the sides were good, which was a nice change of pace from the ‘cue I’ve been eating lately. Overall, I’d say I enjoyed the meal at Sauceman’s, despite being sorely disappointed by the pork. 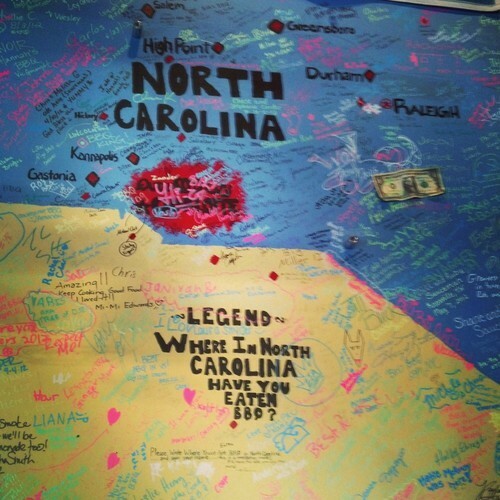 I’m not sure I’ll go back – there are a couple other places in Charlotte I prefer, but I’m glad I got to try it. The lesson learned here is that you may get one shot with the Barbecue Bros, so you better bring it!